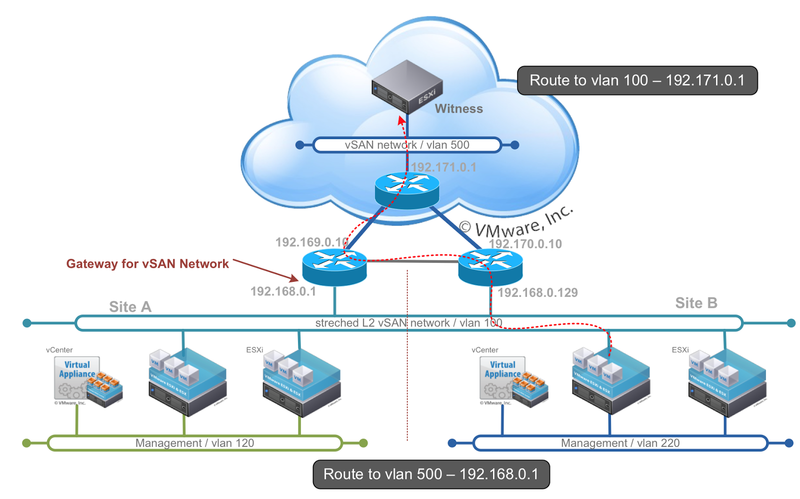 VMware vSAN 6.2 Stretched Cluster & 2 Node Guide covers greatly all the network topologies supported and the configuration steps involved on setting up such solution, but the guide does not detail some network aspects which could pass unnoticed and cause some issues down the road in case you did not consider them during design phase. That’s what I’m trying to help clarify today. My example is based on VMware’s recommended architecture, a stretched L2 network between data sites and L3 network between data sites and witness site. If you follow the guide, soon you will notice the hosts from both sites would use the same gateway. If you implement something like that, the traffic from Site B would have to transverse the link between sites in order to reach the witness site. Guest what, in case of link failure between witness site and Site A, link failure between sites or gateway (192.168.0.1) failure, hosts on site B would also be unable to reach the witness, even though there’s an alternate path through the gateway on site B (192.168.0.129). Without access to the witness, the hosts on site B, would not have access to 50% plus of the components and then would not be able to run or restart any VM on it. Back to my hypothetical scenario, to avoid this cross-link situation and make the hosts use their own local gateway and links this is what I’m proposing. I’ll configure half of the IPs to be used on site A and the other half on site B. 192.168.0.2-192.168.0.126, (192.168.0.1 is already taken by the gateway). 192.168.0.130-192.168.0.254, (192.168.0.129 is already taken by the gateway). Now the tricky part, on the witness gateway (192.171.0.1), we will have to tell it to use different routes to reach each subset of vSAN network, each gateway vendor might implement it in its own way. On my design, from the witness gateway perspective, I made my /24 network looks like two /25 networks, even though I did not make any change underneath. Another option would be using dynamic routes among the gateways, not covering it on this post. This way, communication will always follow through its local gateway and link, providing full high-availability for each site. I’m pretty sure there are a lot of different topologies, sites interconnection, and technologies to solve this issue. 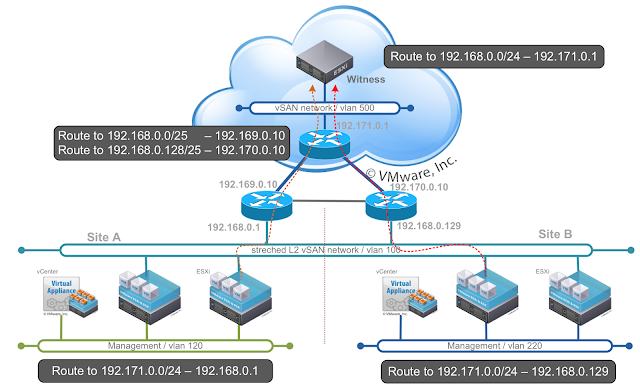 This example is not a single size fits all solution, but my main goal here is to create the awareness that this routing discussion must be taken. Once again I was working on a vSphere Site Recovery Manager project using vSphere Replication as a replication technology and had to explain how to isolate replication traffic from others network traffics, while explaining it is never a problem, I was wondering how many out there still have doubts about it, so creating this post is my way to try reach as many of you as I can. But before we start we should ask ourselves, why isolate the replication traffic ? 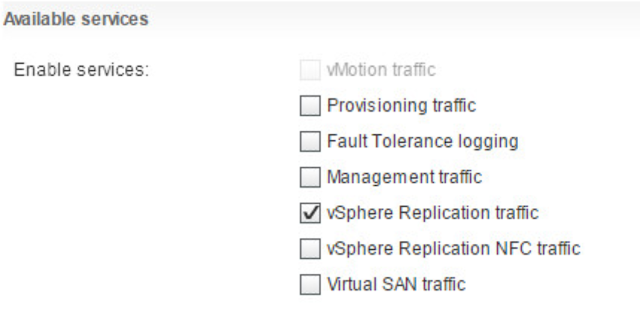 While vSphere Replication Installation and Configuration guide has a procedure on how to accomplish the isolation, it does not really explain how it works and what the replication flow looks like, let’s see if I can through some lights on it. 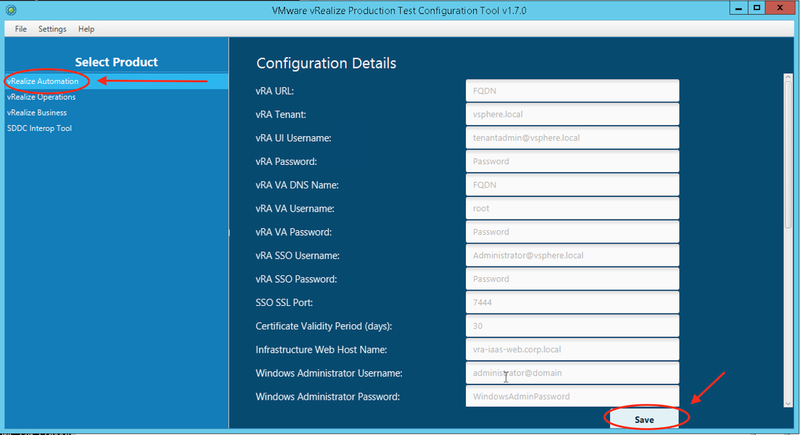 - a replication segment on each site (VLAN 110 and 210). The goal, again, is to isolate the replication traffic from other traffics. Obs: I’m intentionally hiding other services like vMotion or VM’s network to keep it simple, but imagine they are all running on their own segments. The way vSphere replication isolation works is sending and receiving the replication traffic through some specific VMkernel adapters, as we will see bellow. I might be to conservative in here, creating one VMkernel for each traffic direction, while it allows more granular control it also might create some additional complexity and requires more effort setting up the environment. Obs: We are creating both VMkernels adapter on each host, so they can work bi-directional, which means, it could be a source of a replication but also a destination. If you remember ESXi TCP/IP stack there’s not individual stack for replication, so it would use the default gateway (on management interface) to replicate the traffic to a routed segment, that’s not our goal. 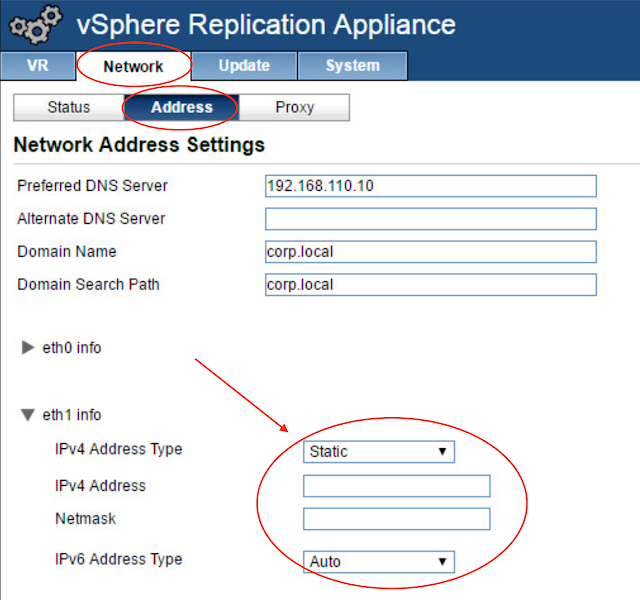 In this case, we must add a static route to each and every ESXi host telling to use another route through the new VMkernel interface to reach the replication segment on the other site. (KB2001426) is a very nice KB on how to add static routes to ESXi hosts. vR comes with a single vNIC, which is used for everything, management traffic, which involves communication with vCenter and ESXi and coordination with other vRs as well, plus replication. 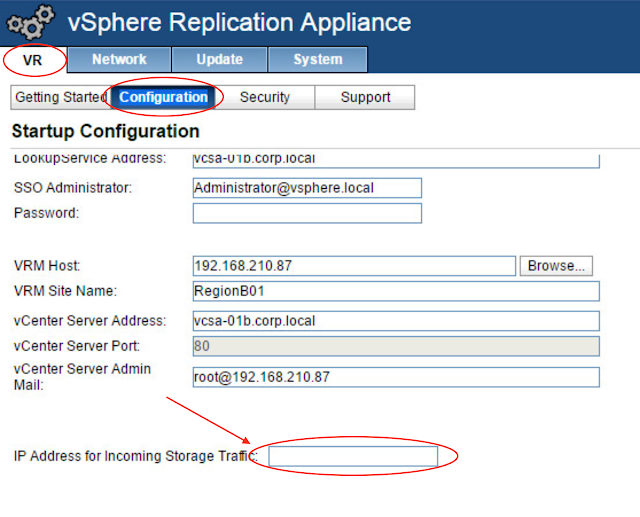 Since we want to isolate the traffic, we will add a second vNIC just for this purpose. - Add the recently configured replication IP at IP Address for incoming Storage Traffic field. As has been on ESXi, we don’t want to use the default gateway, on management segment, to send the replication traffic, so we need to add a static route to vR. Since it's a Linux box we can add the static routes information to /etc/sysconfig/network/routes file. As we can see the traffic is isolated from management segment and hopefully from others. Others can argue that you could create a dedicated segment for vSphere Replication traffic (outgoing) and other for vSphere Replication NFC traffic (incoming), but personally I believe, since it’s all replication traffic related, breaking it down further just adds complexity, so I like to keep it simple with a single segment for all replication traffic, incoming and outgoing. We are done, you can start a replication and see if the traffic is following how it supposed to. 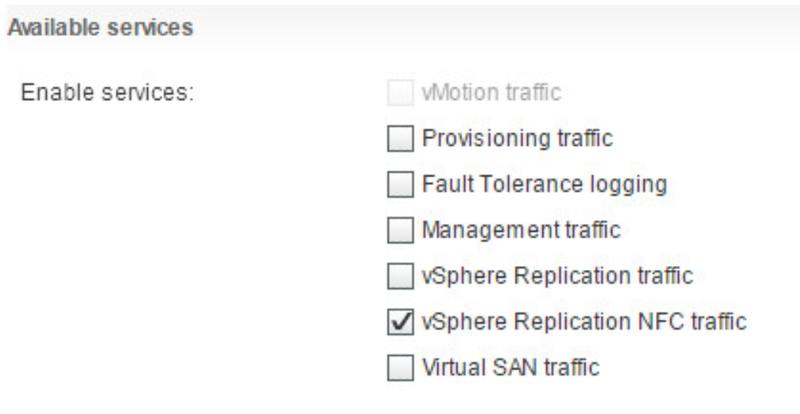 Hope this makes clear on how to isolate vSphere Replication traffic. Maintain a healthy environment is part of any IT Administrator’s duty, sometimes is hard to assess several components that might compound a solution, would it not be nice to have a tool that looks at these solutions and provides you a health report ? Well, that’s what vRealize Production Test is all about. 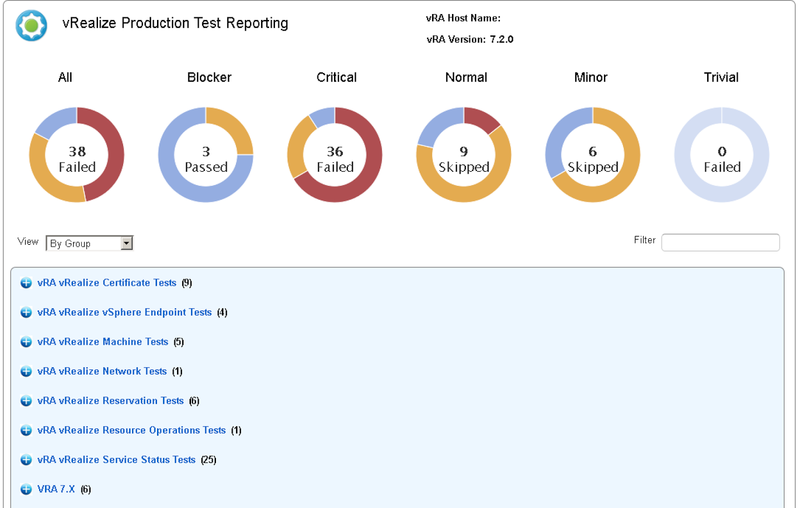 It started as a testing tool to vRealize Automation but VMware has been evolving it during the past months and now it includes engines to test vRealize Business and vRealize Operations as well. 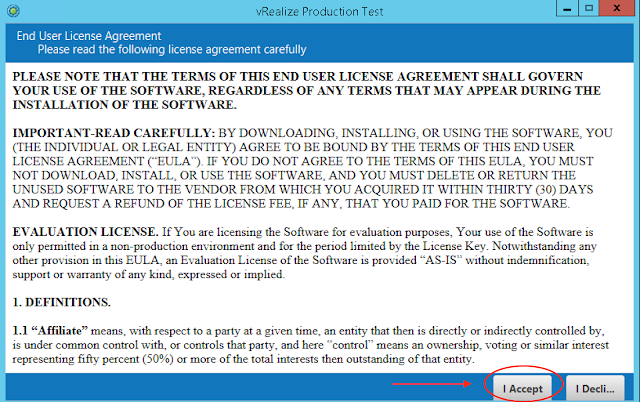 It’s part of the vRealize Automation download page, just go to Drivers & Tools and there is it. It’s based on Java, so be sure you have java installed on the system where you will run it from. The report shows a nice summary of findings, but also a detailed section, where you can learn what has been found and the details on how to fix that. If you want to learn more about the tool, there’s a detailed guide as well.